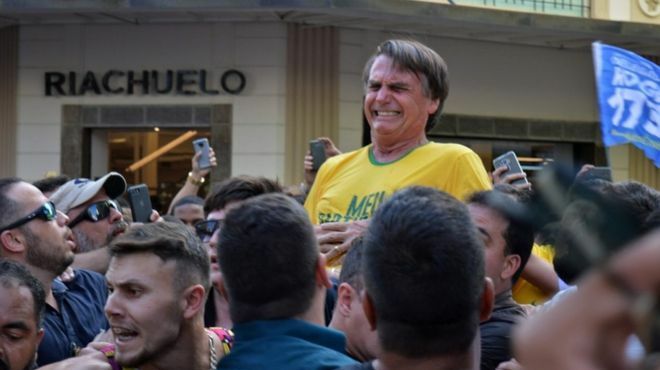 The front-runner in Brazil's presidential election, Jair Bolsonaro, has been stabbed at a campaign rally. Polls suggest he would get the most votes in next month's presidential elections if former President Luis Inácio Lula da Silva remains blocked from standing. Left-wing Lula had been the long-standing favourite but he is currently in prison, appealing a ban on his candidacy because of his corruption conviction. This is another twist - a dramatic one - in what has already been a turbulent campaign. Jair Bolsonaro is the front-runner and he is in a hospital bed, while the only person thought to be able to beat him is Lula - and he is in a prison cell. It is a surreal situation. 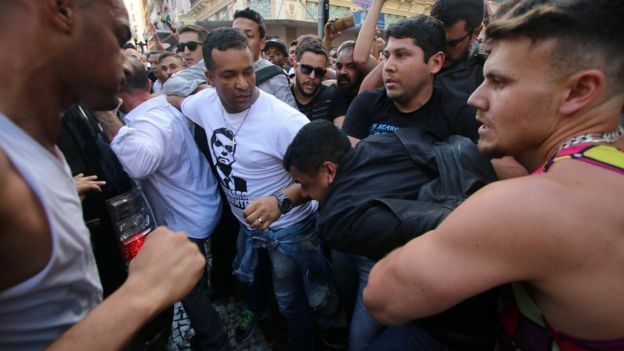 One of Jair Bolsonaro's key campaign messages is that he will try to turn around the growth in violent crime. The fact that he is now a victim himself plays into the hands of his supporters, who see this as a very important problem for Brazil to tackle. Everyone - including his detractors - has rallied around him to condemn the attack. As it has happened so close to the October election, he won't be on the campaign trail for the next week or so. Nevertheless, his supporters will be strengthened, seeing that his concerns are their concerns. This is a crucial time for Brazil, as the country heads towards the most uncertain elections in decades. After the attack, his son Flavio initially tweeted that the wound was "only superficial", but he gave a more sombre assessment two hours later. "Unfortunately it was more serious than we had expected," he wrote. "He lost a lot of blood, arrived at the hospital with a [blood] pressure of 10/3, almost dead. His condition now seems stabilised. Pray, please!" Hospital officials later said Mr Bolsonaro had suffered a "deep" and life-threatening stab wound in his intestines and was in a "serious but stable" condition. He has since been filmed in his hospital bed, making a hoarse statement. He described how what he thought was "just a blow" turned into an unbearable pain. He had "never hurt anyone", he said. Mr Bolsonaro's electoral rivals have all condemned the stabbing. Fernando Haddad, who is expected to replace Lula da Silva on the Workers Party ticket, said the attack was "absurd and regrettable". "Tolerance is a part of democracy. It is a part of the rule of law," he said. 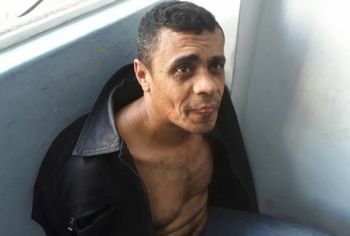 The president's predecessor, Dilma Rousseff, warned that the attack cannot go unpunished "because it must serve as an example so that it doesn't happen to any other candidate". How did he become a presidential contender? A former army captain, Mr Bolsonaro entered politics in the 1980s to defend the rights of military personnel. Few imagined at that time that he could become a serious contender in a presidential poll. But the collapse of the Workers' Party government and the impeachment of President Dilma Rousseff two years ago revealed the extent of political divisions in the country. Mr Bolsonaro's outspoken rhetoric and his defence of law and order appealed to many who blamed the left for corruption and the economic crisis.